Summary: Web page version of our pamphlet for parents. Does my child really need one? The simple answer is yes. Laws now require helmets in many areas. That is because medical research shows that a bicycle helmet can prevent most cyclist head injuries. More than 800 bicycle riders are killed in the U.S. every year, almost all in collisions with cars, and 75% of them die of head injuries. Many thousands more suffer less severe but still debilitating injuries that are far worse than the physical pain of scraped skin or even broken bones. Your child can suffer permanent personality changes and learning disabilities from a brain injury, and both of you will be aware of what they have lost. Common long-term effects include concentration difficulties, aggressiveness, headaches and balance problems. Imagine a parent's anguish if this happens to their child. Helmets sell in bike shops from $30 up, or in discount stores for $15 and up. A good shop helps with fitting, and fit is important for safety. Lab tests show that a discount helmet is equally protective if you take the time to fit it carefully on your child. All helmets are cheap for their benefit, so don't wait for a sale. Will I have to buy one every year? No. Heads grow less than legs and feet. Many child helmets come with two or even three sets of foam fitting pads. You can start with thick pads and use the thinner pads as your child's head grows. The fitting pads do not affect the impact protection of the helmet. That is provided by the firmer crushable foam (picnic cooler foam). Will my child actually use it? Yes, if other children wear one, their parents and other role models use one, the teacher at school has told them how much good helmets do, and the child has picked out the one they really want. No, if the helmet makes your child feel like a geek, nobody else uses one and it does not fit well. Yes if you have the will to enforce the rule. Most situations fall somewhere in between, and you know your child best. Seventh grade seems to be the most resisting age for helmets, when the feeling of invincibility is strong and the rage for fashion is undeniable. The key motivator of helmet use for kids is fashion, not safety. Try to make use of that if you can. We have more tips on getting kids to use helmets. Does A Toddler Need a Helmet? A child of any age needs head protection when riding, but a small toddler's neck may not be developed enough to support the weight of a helmet. For this and other reasons, nobody in the injury prevention community recommends riding with a child under one year old. If in doubt, take child and helmet to a pediatrician for advice. Child helmets need ventilation in hot weather, since the foam holds heat in. Toddler heads vary in shape, so pay careful attention to fit. 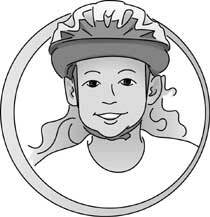 The helmet should sit level on the child's head, and fit securely with the strap fastened. We have more info on taking your toddler along. All helmets sold in the U.S. must meet the US Consumer Product Safety Commission CPSC standard and state that on a sticker inside. Fit is not tested by the standards, so you have to try the helmet on your child's head. Outside the US you should be careful to look for a standards sticker that you recognize like the European CEN standard or the AUS standard in Australia. Fit is not tested by any of the standards, so try the helmet on your child's head before buying. There are many good helmets on the market. Consumer Reports has a few brand recommendations. But since the impact performance is legally regulated, you can choose based on how well a helmet fits your child and the one your child likes. And the price, of course! Guide your child to pick a helmet with a smooth shell in a bright color. It's nice to have a pinch-proof buckle. Put it on your child, adjust the straps and pads or the inner one-size-fits-all ring, and then make sure it will not come off. Replace any helmet when your child crashes in it. Impact crushes some of the foam. The helmet is less protective although the damage may not be readily visible. Helmets soften impact, so the child may not even be aware that their head hit until you examine the helmet for damage. Replace the buckle if it cracks or if any piece of it breaks off. Nobody prompts you to replace your child's helmet, so give it some thought. Bike Helmets for Other Sports? Standards for biking include inline skating. There is no standard for tricycle or scooter helmets, but CPSC says bicycle helmets work well for them. Aggressive extreme trick skating and skateboard helmets have a different standard (ASTM F1492) for multiple hits but lesser impacts. Most skate helmets meet bike helmet requirements, but only if they have a CPSC bike standard sticker inside. Skate helmets may not meet bike helmet requirements unless they have a CPSC bike standard sticker inside. Helmets for equestrian sports have a unique design to resist a horse's hoof. BHSI is a helmet advocacy program whose volunteers provide helmet information and work on the ASTM national helmet standard committee. We are funded by small consumer donations of about $11,000 a year. We do not accept funding from manufacturers or anyone involved in helmet sales. BHSI is located at 4611 Seventh Street South, Arlington, VA 22204-1419, tel. 703-486-0100. Our Web server where you found this page is at www.helmets.org. You can contact us by email. This pamphlet was produced with donations from those who read it earlier. We welcome your tax-deductible donation to make it available to the next rider or parent who will need it. Thanks! Reproduction of this pamphlet for non-profit use is encouraged. Links to this page are encouraged. We update frequently, so if you put this page on your own server it will be quickly outdated! Available as a two-sided pamphlet in Word or in .pdf format. If it will not work on your printer, contact us by email or the postal mail address above and give us the postal mailing address where we can send you a paper copy to reproduce. We can't mail it to your email address!